Are you thinking of buying a house, but do not do know how, or who to ask? You’re probably well aware of how important your credit score is. A good score grants you access to loans and favorable interest rates for a mortgage, and opens up many different possibilities for a healthy financial future. Reprinted with permission from The Real Estate Book®. ©2018. All rights reserved. 1. What determines why my property is needed? 2. Does the department have the right to acquire my property? 3. How far in advance will I know that my property is needed? 4. What will I be paid for my property? 5. What happens if an agreement to sell cannot be reached? and 50 more questions answered. Now is a great time to buy a house because prices are so low, but more importantly, interest rates are extremely low. I think you would have to go back to the 1940’s to find interest rates this low. But interest rates are beginning to creep up. They are bouncing between 3.75 and 4.25 right now and trending higher. Interest rate is amazingly important in the final price of your home. For instance, in 2000 interest rates were running closer to 10%. Anything under ten was a good rate. At the height of the housing market, anything in the sixes was a good rate. Over the last year we have been in the three’s. For example, the total cost of a house that sells for $100,000 will vary by $150,000.00 in the actual amount a person pays for the house. 9.75% will have a monthly payment of $859.12 for a total payment over 30 years of $309,295.89. 6.50% will have a monthly payment of $632.07 for a total payment over 30 years of $227,544.99. 3.25% will have a monthly payment of $435.00 for a total payment over 30 years of $156,674.27. If it is a time in your life that home ownership makes sense for you, now is a great time to buy a home!! Call 811 Before You Dig – It’s Free! Who knew that planting a tree in your yard or digging holes for the supports on that new deck you are adding to your home could be a dangerous thing to do? Unseen and rarely thought about: buried utility lines and pipes crisscross our streets and our yards just inches below us and puncturing or severing any of them can be expensive, or worse, deadly. You would think the chances of hitting one of these lines would be slim but in fact one is hit every three minutes in the U.S., according to the Common Ground Alliance, who tracks these incidents. Please be aware that you could incur fines from local regulators and be responsible for repair costs associated with fixing the damaged utility line as well as being held liable for any neighboring homes or businesses impacted by a utility outage as a result of your digging. 811, a national call center number, was created by the U.S. Department of Transportation to help professional excavators and contractors be aware of underground infrastructure. You don’t have to be a professional to call. Anyone can call 811 and your local utilities will send out a professional to find, identify and mark off all buried utility lines – free of charge. 811 Know what’s below. Call before you dig. When planning your move, packing can be the most stressful part. That’s why most everyone saves that task for last. Using any or all of these 10 packing ideas will take some of the pressure off during packing and, just as important, when unpacking too. 1. Freebies – Why buy boxes when you can get them for free? Go to Freecycle.org or the “free stuff” section on Craigslist. Both list items by location. It’s best to find boxes of varying sizes. Avoid supermarket cartons that may contain messy or smelly food residue. 2. Pack Backwards – This means starting with the last room you will unpack which is typically the kitchen and pack the first room you’ll want to unpack last – typically the bedroom. Loading the boxes in this order for the move helps on the delivery end too. 3. Color Coding – No one needs to know what’s in which box but you, right? Use assorted colors of duct tape or sticky dots and use the same colors on the rooms in the place you move to. Mark all sides of the box so no matter how they are stacked you can always identify where it goes. 4. Bag & Tag – Leave your hanging clothes on their hangers and group a few hanging clothes together with a twist tie, slip a black garbage bag over them, and make a hole in the top of the bag for hanger hooks to stick out. Mark which room they go to with your color code tape (see #3). To “unpack,” simply remove the bag and tie. 5. Cover It – Instead of buying the mattress cover sold by your mover, leave the fitted sheet you use regularly on your mattress, then cover both sides of the mattress with two older fitted sheets you no longer use. 6. Wrap It – Don’t bother emptying out the drawers of smaller furniture like end tables or corner desks. Wrap heavy-duty plastic wrap around it from top-to-bottom and side-to-side. This seals the drawers in place, and saves you hours of unpacking. 7. Tape It – If certain furniture pieces require disassembly, place all bolts, screws and small pieces in a Ziploc bag and tape the bag with clear packing tape to the bottom of the piece. 8. Pad It – When packing the moving truck, use socks or rolled t-shirts between items that could bump up or rub against each other in transit. This is especially handy inside boxes for wrapping around breakables like glassware. 9. Even It Out – Even out the weight when loading furniture and appliances in a moving truck to help prevent damage. Place the refrigerator in the front right section of the truck and the washer and dryer opposite, front left. 10. Secure It –When loading your plastic-wrapped furniture, place the side with drawers against the wall of the truck to prevent them from opening. Use tie-downs or bungies on the side walls for added security. Remember, things shift front to back as well as side to side. Everyday we hear on the nightly news that homes prices are up and that sales are up 25% from a year ago. I wish this were true here in Lamar County. I have been tracking sales since January 2000 (when I first started in real estate). 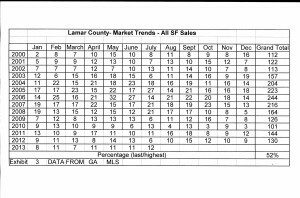 The above chart shows the history of single family home sales in Lamar County. This data comes from homes sold by real estate agents listed with Geogia MLS. This is not data from the tax records, because when I started that data from county sales was not readily available. 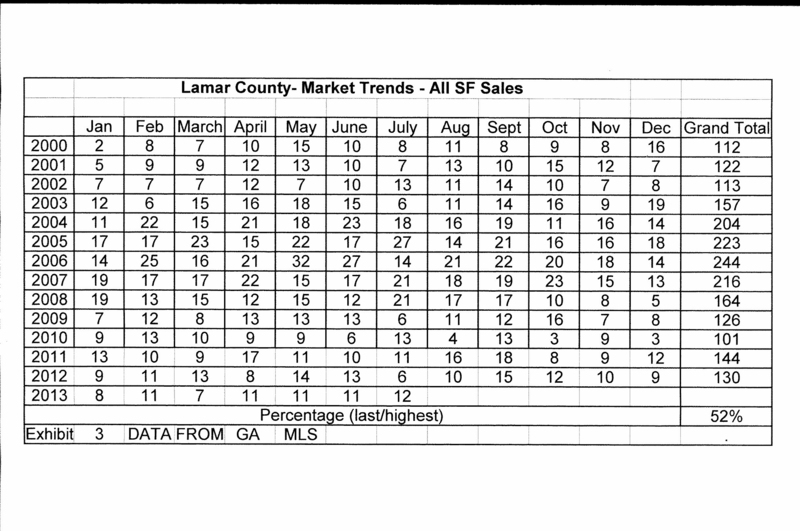 In Lamar County, we peaked in 2006. Specifically our highest monthly sales were May 2006. We benefitted from 3 things. Interest rates had dropped. From an earlier blog you can see that 9.75 on a $100,000 loan, the payment is with interest and principle for 30 years is $859.12, but at 6.5% the same loan is $632.07. Many people realized they could sell their current home and buy a bigger house for the same payment. When interest rates dropped, more people could afford to buy a home. Lamar County had buyers working in McDonough but willing to drive to get into the country while gas prices were low. When gas prices went up and home prices dropped, our sales dropped dramatically. Even though interest rates are unbelieveably low, our sales have not gone up. 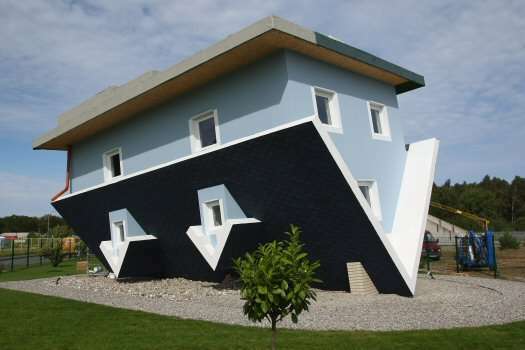 People are upside down on their mortgage and cannot sell to buy a bigger home. Buyers are not willing to drive as far due to the price of gas. In order for your lender to determine your options, all borrowers listed on the loan must provide certain financial documents to their lender. Most recent quarterly or year-to-date profit/loss statement–signed and dated. Commplete list of real estate that you own, including the monthly payment for all mortgages, taxes and insurance (if not impounded/escrowed) and any homeowner association dues. Most recent bill or letter from Homeowners/Condominium Association reflecting dues. You are not required to disclose child support, alimony or separation maintenance income, unless you choose to have it considered. Divorce decree, sepaaration agreement, other written agreement filed with the court, or decree that states the smount and period of time payment will be received. This could include bonuses, tips or investsment income. Documentation describing the nature of the income, such as an employment contract or documents tracking tip income. Two most recent bank statements (all pages) or other proof showing receipt of income. When starting the short sale process, select a big box or folder and keep all of your documentation in this one place throughout the short sale. As time passes you will be required to update documentation. This process is not easy, and is often frustrating, put do not give up. Short sales happen everyday. The short sale process requires patience and diligence. Good luck. Information courtesy of Bank of America. Are you upside down with your mortgage? Talk to your lender. If you are in trouble with your mortgage, there are several sites on the internet that are helpful. Your lender looks at the request and categorizes you into one of 2 categories: Has Hardship or Has NO Hardship. For people living in Georgia who have lost their employment, Georgia has a program to help. The details can be found at www.homesafegeorgia.com . Due to previous abuses by the lenders in the past, such as robo-signing, improper documentation and lost paperwork, in March 2012, the federal govenment released details of the $25 billion dollar National Mortgage Settlement stemming from improper foreclosures and other deceptive practices in the origination and servicing of mortgages. The agreement with Bank of America Corp, JP Morgan Chase & Co.,Wells Fargo & Company, Citigroup Inc., and Ally Financial Inc. (formerly GMAC) is designed to provide eligible homeowners with relief as well as prevent future abuses. More information on this can be found at the governments Making Home Affordable at http://www.makinghomeaffordable.gov/programs/exit-gracefully/Pages/hafa.aspx. Do You Know What’s in Your Credit Score? Credit scores are calculated from different credit data in your credit report. The most common credit-scoring system was developed by the Fair Isaac Corp.(FICO) and is used by major credit bureaus to evaluate your credit history. The system considers factors like how many credit cards you have and how quickly you pay your bills, and assigns you a rating between 300 and 850. Two of the most important factors affecting your score are your payment history and whether you’ve had any collections. Other factors include amounts owed, types of credit used and length of credit history. 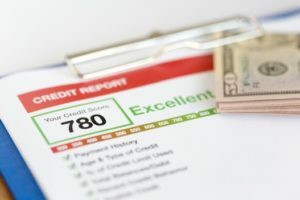 According to FICO whose credit score represents an industry standard, raising one’s score from 550 to 720 produces a savings of $131,000 over the life of a 30-year mortgage. Nest are some helpful hints in raising your credit score. The third step is the most bewildering for first time home buyers. After you have looked at the market and have decided this is the house you want, how do you create a contract to buy your house? Working with a Realtor makes this easy. Your realtor has access to a vast array of contracts that are designed to address most needs of both the buyer and the seller in a contract. In Georgia, you can create a contract on a scrap of paper with just a few words. But if a difference of opinion arises or issues with the house, a scrap of paper may not be enough to protect you and keep you out of court. Let us assume you are going to use a realtor, hopefully a Dora Cox Realty realtor. Housing prices are always negotiable. The Seller may not take less, but you can always try. Besides the price, a contract spells out who pays Buyer’s closing costs and how much; when will you close on the house; which attorney will handle the closing; and many other issues. Your realtor will ask you many questions designed to make the contract as close to your needs as possible. Then the contract is submitted to the Seller. The Seller then decides what to agree about the contract and what to counter on the contract. If the Seller signs the contract without making any changes, the contract negotiations are complete and the contract is binding as soon as the Buyer gets a copy. If the Seller makes changes to the contract, it is considered a “counteroffer.” The Buyer can then make sign the counteroffer without making changes and the contract negotiations are complete and the contract is binding when the Seller gets a copy. But if the Buyer makes any changes to the counteroffer, the you are still in negotiations. The offer can go back and forth as many times as needed till both parties agree to all conditions of the contract.